So Saturday saw Alan, Pete, Jon, Richard, Lloyd (the chauffeur) and myself congregate at Excel London for the South London Warlords’ show, Salute. 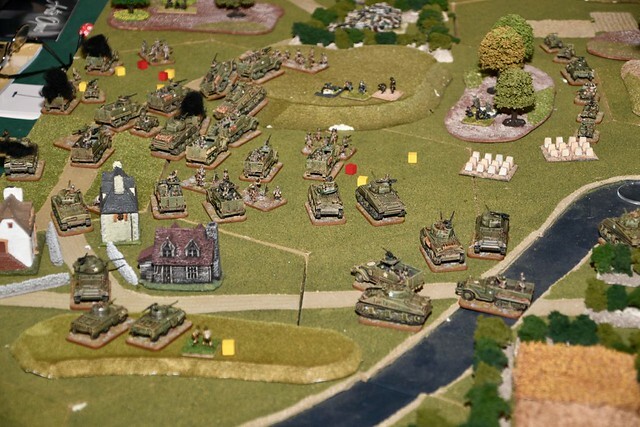 We were there representing both Abbeywood Irregulars and Surprised Stare Games and promoting the final release of Mission Command: Normandy which was available to buy from the Surprised Stare Games stand, along with a couple of Wars of Roses games (just to mix things up a little). 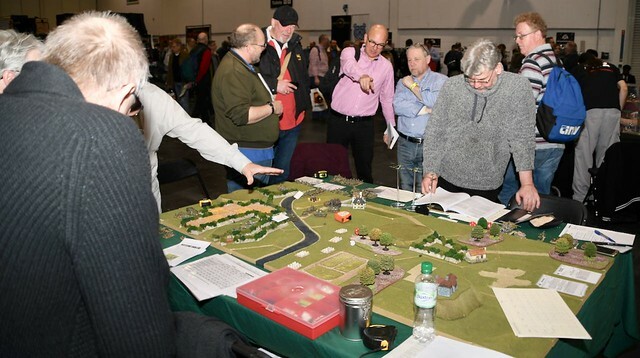 Alongside the trade stand we had demo game table where visitors to the show could see the game in action and ask questions of the team regarding the rules, what made Mission Command different from the other WWII rule sets already out there and why they should give it a try. Throughout the day the table saw a steady stream of inquiries, but even so the team managed to progress the game along a small number of turns. A marked improvement on last year when they didn’t appear to move a single figure all day! All in all a very successful day, though everyone was quite relieved when 5 o’clock rolled round and it was time to pack up and head home. So much so that two members of the team had quite the nap on the way back. A small selection of photos from the day can be found on Flickr at https://flic.kr/s/aHsmCgT9gV. As a taster of the day, here is a short timelapse video that was shot showing the scene from the Surprised Stare Games’ stand for the first couple of hours of the show. Big thank you to Lloyd for operating AWI Taxis for the day and to everyone who dropped by either the table or the stand to make the day pass so quickly. Off to Reveille II again!